The Russian steelmaker has remained one of a handful of bright specks in the dimming landscape of the Russian metals sector. After it posted strong Q1 2014 results, Fitch upgraded Severstal’s credit rating to BB+. Most of the metals industry still faces an uncertain future, with growth stalling in key economies like China and the EU, cost pressures rising and industry profitability under strain, both in Russia and globally. Russian steelmaker Severstal has remained one of a handful of bright specks in the dimming landscape of the Russian metals sector. The company recently reported first quarter 2014 financial results which demonstrated that, despite the tough operating environment, it remains what we here at ATON regard as the most efficient and profitable Russian steelmaker, with a consolidated earnings before interest, tax, depreciation-and-amortization (EBITDA) margin of nearly 18%. As with the rest of the steel sector, the burden of debt still hangs over the company, with a gross debt of $4.4 billion at the end of the first quarter. However, strong free cash generation and nearly $900 million in the bank put the company in a good position to weather the challenges that the ongoing slump in steel markets may pose. 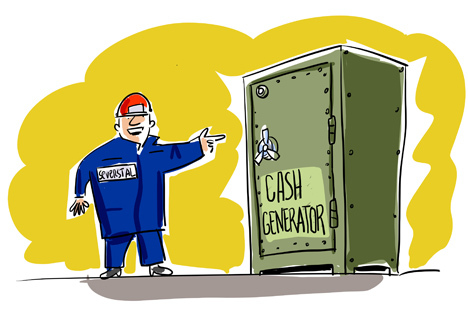 Moreover, a combination of low leverage, ongoing operational enhancements, and reduced capital expenditure has turned Severstal into a solid cash generator, allowing it to increase dividend payments. The company is the only Russian steel firm that reliably pays quarterly dividends. This leadership has been reflected in the company’s share performance. Despite the fact that its Global Depository Receipts remain down around 8% year-to-date, the shares have performed better than Severstal’s peers, whose capitalization has shrunk 20-30%. Severstal’s strong financial standing has also spurred interest from debt investors. A few weeks ago Fitch upgraded Severstal’s credit rating to BB+ with Stable outlook, citing an improvement in the company’s profitability thanks to greater production efficiency and successful deleveraging. Severstal is indeed reaping the benefits of the operating efficiency and cost saving initiatives it has been implementing since it completed its large scale growth and modernization project about three years ago. According to the company, these initiatives should continue in 2014 resulting in further General and Administrative cost reductions, and lower production costs. For instance, 2014 G&A costs are expected to decrease 20% compared to 2012, from around $750 million to approximately $600 million. In the mid-term, the company has also restricted its capital expenditure to $1 billion a year. However the best confirmation of the success of Severstal’s strategy is the reaction of its peers, who are trying to emulate Severstal’s achievements by implementing similar steps at their own plants. These peers have fallen behind for various reasons, including ongoing large-scale projects and financial constraints, but they are trying to catch up fast. As for the recent speculation in the press over the fate of Severstal’s U.S. assets, they were not a complete surprise. The company has shown an ability to move fast when it sees an opportunity to buy or sell assets. It did not flinch when it was forced to sell a number of its loss-making U.S. assets when steel markets crumbled in 2008-2009, despite having to record a significant loss in the process. This time the setting is different: in addition to economic uncertainties, the political landscape is also becoming challenging, with Russia’s relationship with its Western counterparts deteriorating as a result of recent events in Ukraine. Russian companies may be forced to review their global footprint and in some cases even consider retreating to within the national borders. Should this scenario play out, Severstal, once again, is likely better placed than many of its peers to withstand that challenge. The two plants it operates in the U.S. are among the most modern steelmaking facilities in the country and, most importantly, they are among the few still making money. This should make the task of finding potential bidders reasonably straightforward. Why are Russian metals companies withdrawing from the U.S. and Europe? While we do not believe that the current political challenges will necessarily force Russian businesses to relinquish their interests in the U.S. or Europe, Severstal may be among the proactive if selling its U.S. plants generates value for shareholders, allowing it to pay dividends or deleverage the balance sheet. The company has invested around $3 billion in its U.S. plants to date. We believe that this time it may be able to see a reasonable return on its investments in the U.S.
Dinnur Galikhanov is a senior analyst in metals and mining at ATON equity research in Moscow.